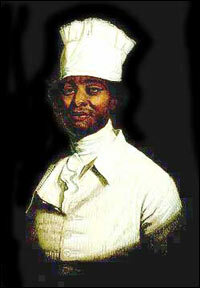 An interesting article on the history of African-American chefs at the White House. Read it here. Some kitchen stories are complicated — full of mystery and missing pieces … “Hercules and Hemings” is one of these stories. In this piece, Hidden Kitchens turns its focus to the president’s kitchen and to some of the first cooks to feed the Founding Fathers — the enslaved chefs of George Washington and Thomas Jefferson. What does this have to do with Classics? “It was Hercules who really began this long connection of presidents and African- American cooks,” says Sharron Conrad, historian of African-American cuisine. …Hercules, one of George Washington’s slaves, came to be the chef of Washington’s kitchen at Mt. Vernon and later in the nation’s early capital in Philadelphia. Hercules, Cesar — names of Rome and antiquity were often bestowed upon slaves along with the last names of their owners. Lots of stuff to think about here–from the connections between slave-holding societies to the strength and significance of the classical tradition in the American South to the implications of the naming of slaves.